My daughter the Goddess and I get to spend a lot of time together when my son is at school or in therapy. Usually we are sitting at the library or walking around our little town. On this particular day we headed to the bank to make a deposit (woot) and she asked if we could go to the pet store. Originally I said no but thought better of it and we headed it. Mostly I thought how sad that basically she gets to run a million errands or wait for her brother most hours so why couldn't I do this for her. I am so glad I did. 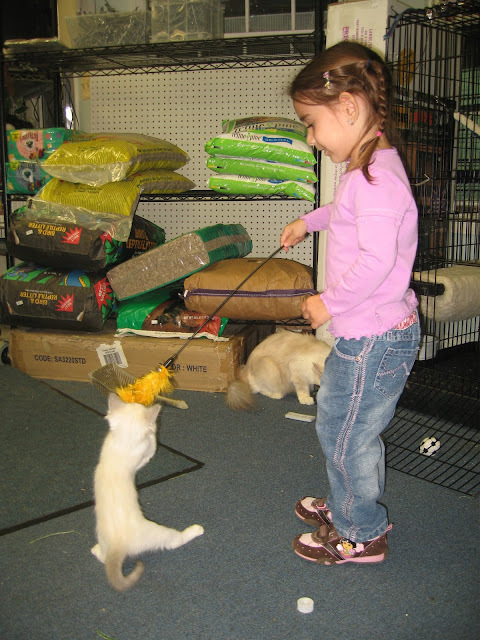 I adored watching her play with the kittens and walk around the store looking at various animals they have there. We chatted like girlfriends and played and pet the kittens. I loved hearing her talk to the kittens, calling them when they hid under shelves. "Kittens, oh, kittens, where are you?" She had a blast and I took about 200 photos. We stayed for an hour and bought nothing. I am sure the store hates me but we will be back and she and I can't wait. Moral, take time to do the things you didn't think you would have time for. Take the detour, stop and smell the roses or in this case pet the kittens you never know what wonderful memories you will be making. I love going to pet stores and seeing all the animals.